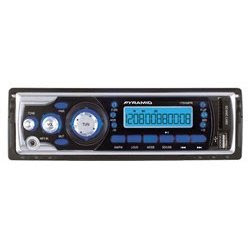 Amazon.com is selling a Pyramid car stereo - 1704MP AM/FM Receiver MP3 Playback via USB/SD/AUXIN for $19.99. Half of you are probably wondering what does that mean. Basically if you don't have an easy way to hook up an MP3 player to your car radio, you might want this. Unlike those FM transmitters that can have interference, this stereo can use a USB cord to connect your MP3 player to your cars audio system, SD cards [usually found in digital cameras] loaded with MP3's to play music, or lastly use the head phone jack of the MP3 player connected to the head phone jack in the stereo display itself. Installation instructions are included with the product, and if you are somewhat handy you should have no problem installing this yourself.